Denno Senshi Porygon is the VJ bot for the DJ sets of the Scientists Rotating. It is programmed in Puredata, a dataflow language of the Max family, which is open source and available for many operation systems. It needs the Puredata extensions zexy and Gem, which are included in the pd-extended distribution or available as seperate packages. The name is derived from the infamous Pokémon episode which allegedly caused seizures in some viewers. A demo video for the VJ bot is available at archive.org. Unfortunately, archive.org seems to have some problems with converting the video to mp4, so just imagine the grey areas in the video as black. 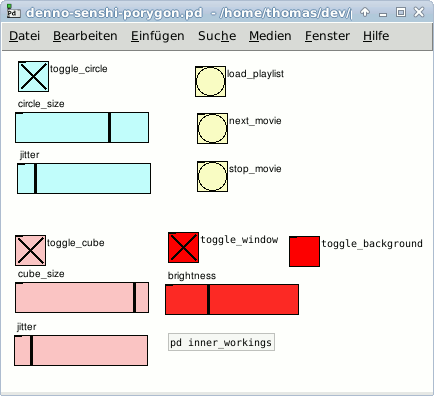 The playlist is a textfile with one video file per line, terminated with a semicolon. If [regex] exists in your search path, then you can insert comments with #. The patch is available under an MIT style license, i.e. (more or less) do what thou wilst shall be the whole of the law. The GUI is quite easy to understand and there are only a few knobs and buttons to tweak the performance and adjust the patch to the loudness of the input signal.